Heritage Garment Preservation wedding dress cleaning and preservation offers high quality wedding gown cleaning and museum quality wedding dress preservation. Our wedding dress preservation techniques are recommended by professional museum conservators and are similar to heirloom garment storage used in fine museums worldwide. Museum Method™ Preservation uses the bagged method of wedding dress preservation and is similar to heirloom garment storage used in fine museums worldwide. Museum Method™ will keep your gown in better condition than boxing or sealing it. With Museum Method™ wedding gown preservation, your cleaned gown is hung on our special shoulder size acid-free, lignin-free hanger. Acid free tissue, acid free stuffing or cotton muslin fills in the bodice area, removing creases and gives added support to your gown. 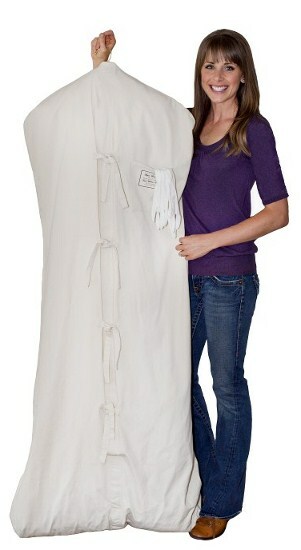 Our natural, un-dyed cotton wedding gown preservation bag covers your preserved gown. You can choose to add a custom label on the pocket of your bag with names of the bride and groom and the date of the wedding. There is also a large pocket on the back of the bag to keep a photo and other memorabilia of your wedding. Your gown is easily accessible! You can inspect your wedding gown to ensure that it has been cleaned to your satisfaction and admire it any time you like. Your wedding dress is protected from damage from wrinkles and creases. Fabric, like paper, is weakened from sharp folding, often resulting in tears or permanent creases. With Museum Method™ creases and wrinkles are almost non-existent! Your wedding dress is protected from acid migration. The acid-free tissue, batting or muslin absorbs acid which could damage your gown. Best air circulation for your gown! Museum conservators all agree that heirloom garments need protection from moisture. Good air circulation helps keep your gown dry if stored away from moisture. Our cotton cover does not seal in any moisture or chemicals, thus reducing the risk of damage from mildew or chemicals. Your dress is protected. 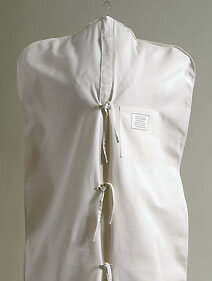 Our garment bag is made from natural, acid-free cotton, the first choice in preservation for centuries. Our bag has no zippers that could snag or rust. It also has a pocket in front to keep the cotton gloves that we include. (You should wear these gloves any time you would like to inspect your dress.) Another larger pocket is on the back of the garment bag. This pocket is for you to keep a photograph of your wedding and a written story of your special day. Your preservation bag can be personalized! You can choose to have a personalized label on the pocket of your preservation bag. The label includes the bride and groom’s names and wedding date and location on it. 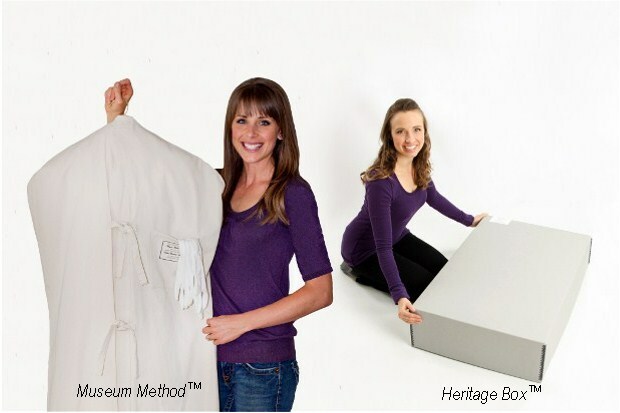 Museum Method™ Wedding Dress Preservation will keep your bridal gown in better condition than boxing or sealing it. Get a free, online Quote for your wedding gown care. With Heritage Box™ preservation, your gown is carefully packed in our archival quality box. We pad all folds with acid free tissue or 100% cotton muslin (for Heritage Couture™ packages). If using tissue, we use buffered tissue for synthetic fabrics, and un-buffered tissue for silk fabrics. Our superior quality wedding dress preservation boxes are not cheap boxes with an acid free coating (as many companies offer) but are acid-free, sulfur free and lignin free throughout. Our standard box, used with synthetic fabrics has a pH of about 8.5 with a 3% calcium carbonate buffer. TAPPI accelerated aging tests show this box will prevent acid migration for up to five centuries! Specifications for our preservation box exceed those used by the United States National Archives and Records Administration. Our un-buffered box, used with silk fabrics has a neutral pH of 7.0 which is safer for storing silk fabrics. Manufactured by one of the most respected names in museum conservation, the boxes we use are also used in major museums, archives and historical societies worldwide. Some historic items which have been stored in these boxes are the baseball uniforms of Babe Ruth, military uniforms of Dwight Eisenhower, gowns of Dolly Madison, and the space suits of the original Mercury astronauts. At Heritage Garment Preservation, we utilize the latest technology to keep your garments in the best condition including Archival Intercept® either at the bottom of the preservation box or lined in the box itself. The Intercept reacts with and neutralizes potentially harmful oxidizing gases which are present in normal atmospheric environments. Common pollutants such as chlorine and sulphur compounds and ozone are permanently bonded and neutralized by Archival Intercept®. For best results, we recommend replacing the Archival Intercept every 5 – 10 years. You may purchase it on our website or by phone order at 866-268-4696. Your wedding dress can be inspected to ensure that it is cleaned to your satisfaction and periodically afterwards, as it is not permanently sealed. Dress can be refolded periodically to reduce creasing risks. 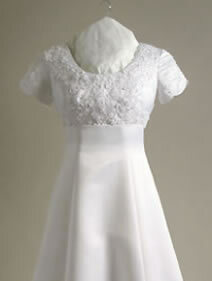 Give your treasured wedding dress the same quality preservation that museums use for their heirloom garments. Choose either Museum Method™or Heritage Box™ wedding gown preservation to keep your treasured wedding dress in the best condition possible.